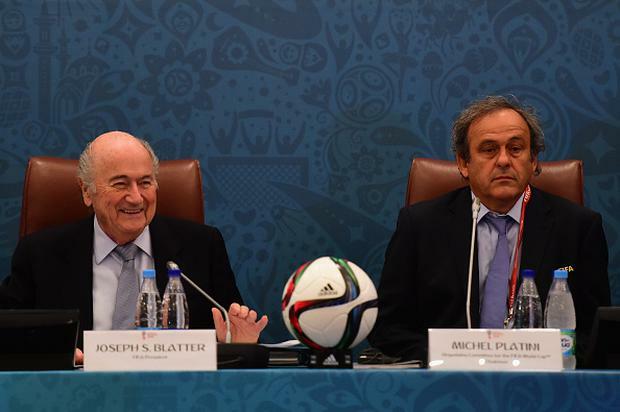 Sepp Blatter (left) with Michel Platini (right). Former UEFA president Michel Platini has claimed "a little trickery" was used in the 1998 World Cup draw to increase the chances of France and Brazil meeting in the final. Platini is currently serving a four-year ban from involvement in football - reduced twice from an original eight-year sanction - after he was found guilty of receiving a "disloyal payment" from then-FIFA president Sepp Blatter. The former France and Juventus playmaker was a co-president of the organising committee at France 98 and admitted the group allocations for seeded teams were made with an eye on a "dream" final. Brazil were placed in Group A, as was the standard practice at the time for the defending champions, with France then allocated to Group C - meaning if both teams won their groups, they could not meet before the final. That was how it turned out, with France triumphing 3-0 at the Stade de France with two goals from Zinedine Zidane. "France-Brazil in the final, it was the dream of everyone," Platini told radio station France Bleu Sport in an interview to be broadcast in full on Sunday. The 62-year-old was laughing as he added: "There was a little trickery. "We did not spend six years organising the World Cup to not do some little shenanigans. Do you think other World Cup hosts did not?" While teams had been allocated to specific groups at previous tournaments, it had typically been to keep countries from the same confederation separate while at Italia 90, the six top seeds were assigned to groups A to F in order. England were placed in the "London group" at both the 1966 World Cup and Euro 96, ensuring they would play all their games at Wembley. Daniel McDonnell On Tuesday evening in Moscow, Gareth Southgate said that his side would be stronger for this World Cup experience no matter how it ended.